The Xisico XS60C. Do You Want Maximum FPS or Maximum Ft/Lbs? 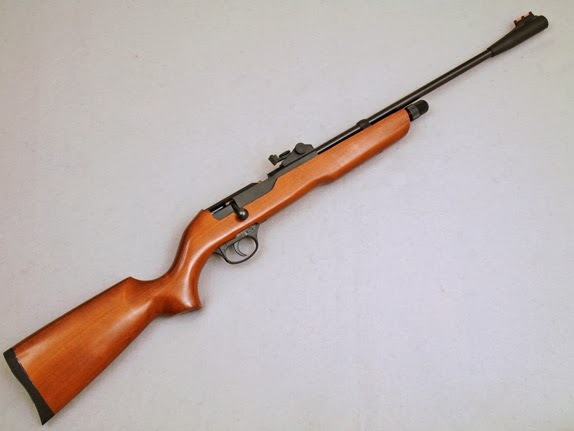 Above, the Xisico XS60C air rifle. "Everyone" - or at least many people - want the maximum possible muzzle velocity - FPS - from their air rifles, believing that this is best. But is it always? 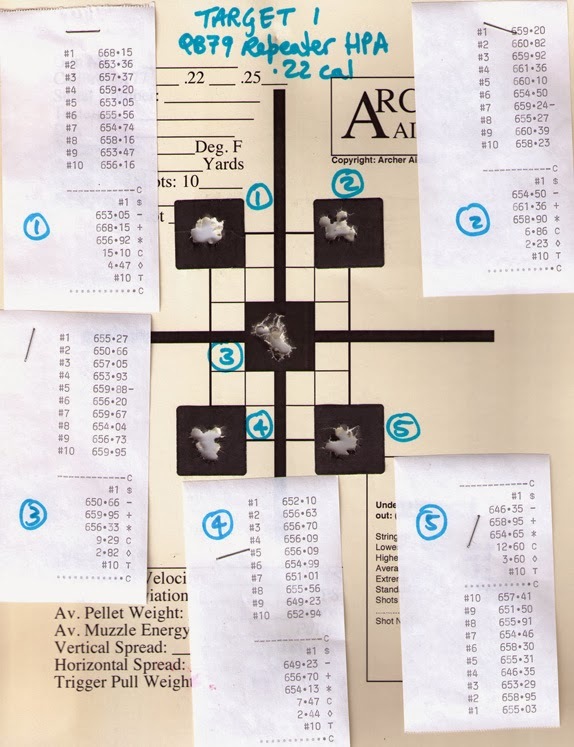 Pellet weight can play a big part in determining the muzzle velocity achieved by an airgun. 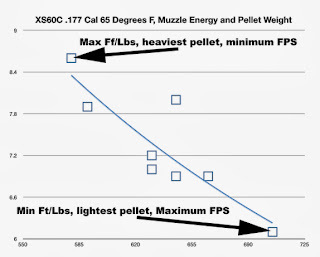 Different pellet weights can produce significantly different muzzle velocities in the same gun, with no other changes. The other major factor to be considered is muzzle energy - Ft/Lbs. This is the "hitting power" of a pellet. 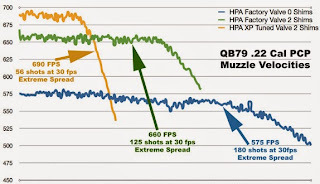 A higher muzzle velocity - FPS - might be best for a flat trajectory and maximum range, but the highest muzzle energy could be most desirable for hunting where a "one shot clean kill" is desired. 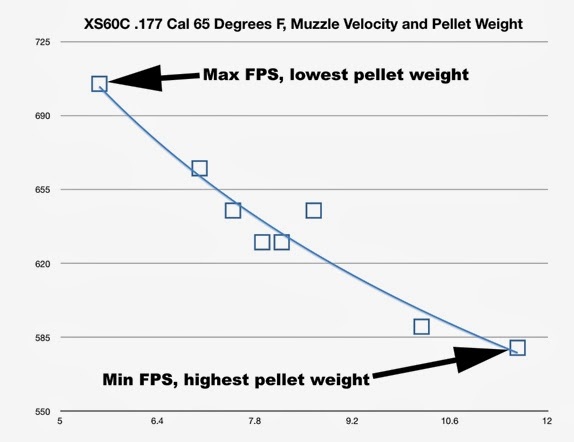 Let's look at the muzzle velocity and muzzle energy results achieved from testing a .177 caliber Xisico XS60C air rifle. 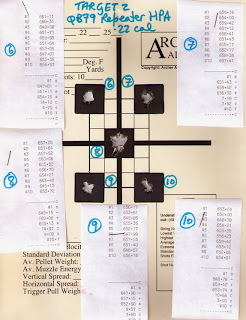 Here's the test data for a .177 cal Xisico XS60C shooting a variety of pellets. (Click to enlarge). 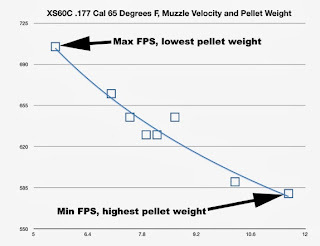 Now, if we take this data and graph the results, we find that the lowest weight pellet shoots the fastest. No surprises here! 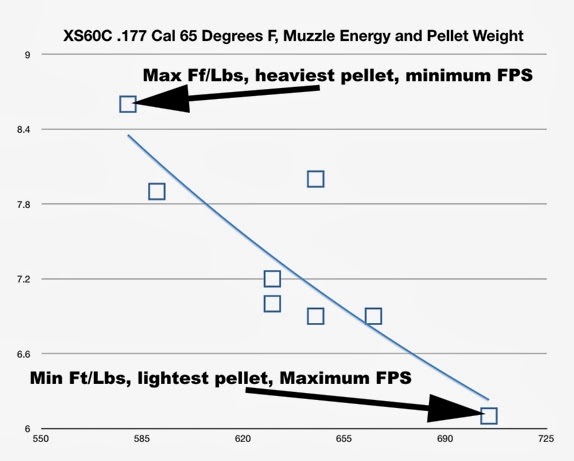 Yet, if we graph the results for muzzle energy, we find that the slowest, heaviest pellet gives the most muzzle energy, or "hitting power". So what should you choose - maximum muzzle velocity or maximum muzzle energy? Or a mid-point somewhere? It's your choice, dependent on the type of shooting you do. But it's good to remember that the highest muzzle velocity is not always the best if you're hunting and aiming for a humane "one shot kill". In this case a heavier pellet, traveling slower, could be a much better solution than a lighter pellet traveling faster. To take an extreme example. Would you prefer to be hit by a very light ping pong ball traveling at 500 FPS, or a 24 Lb cannon ball traveling at 50 FPS? I'll take the light, fast ping pong ball any time, it's WAAAAAAAY less dangerous, even though its' muzzle velocity is much higher. 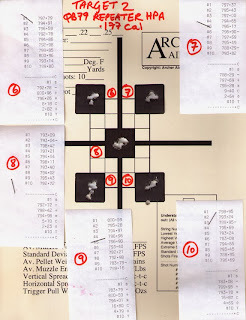 This data applies to the Xisico XS60C air rifle. But the same principal applies to any airgun. Maximum muzzle velocity sometimes may be the best solution, but not always. It depends on what you're aiming at when you pull the trigger. The Ignite Black Ops Sniper Air Rifle is an interesting and innovative airgun that's widely available at Walmart stores. Above we see the Black Ops Sniper Rifle fitted with a much higher quality 4-16x40AO CenterPoint scope for testing. 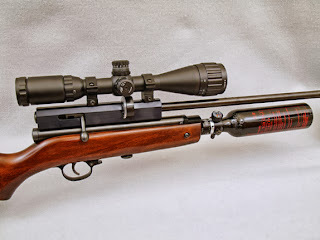 Among many unusual features such as included bipod legs and a fully adjustable stock, the Ignite Black Ops Tactical Professional Grade Sniper Air Rifle (wow, what a mouthful for a product name!) actually has an instruction manual that looks as if it was written by someone who knows something about air rifles! 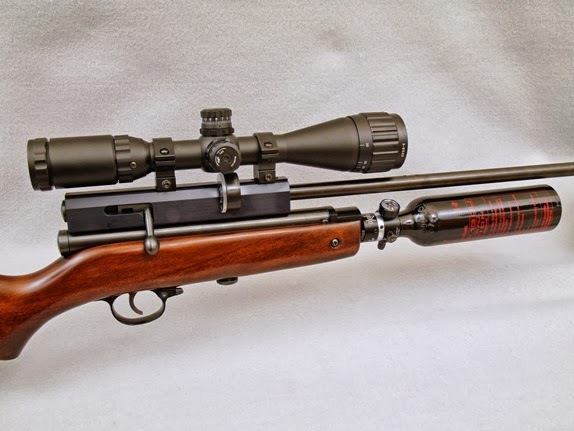 This 12-page operator's manual gives a surprisingly good "Troubleshooting Guide" that covers many common issues that upset the performance of spring/piston air rifles, such as problems caused by loose stock screws and defective breech seals. 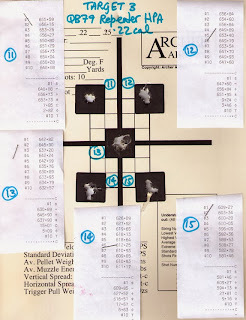 They even give brief advice on the correct techniques for shooting a spring/piston air rifle and the need for practice to obtain good accuracy. 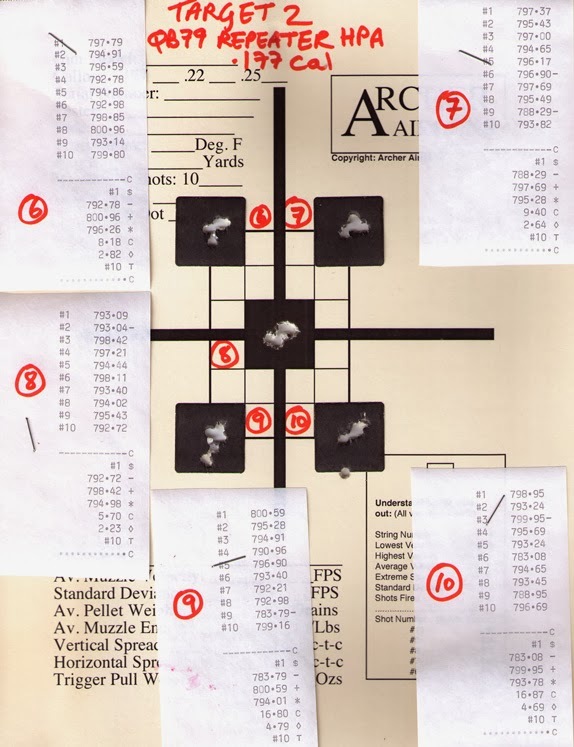 This is in stark contrast to the approach taken by many airgun vendors, where the absolute minimum of information is presented to the new user, often in the form of pictograms that are not intuitive in any language. While it's refreshing to see such information included with an air rifle, the Black Ops (or is it "Ignite"?) manual advises that breech seals can leak and that they should then be replaced. 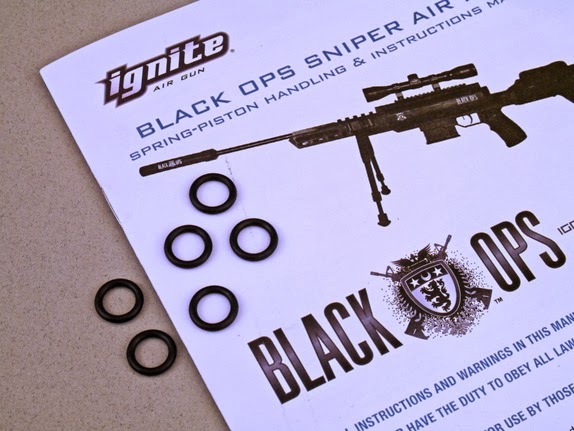 New at Archer Airguns online store is a kit comprising 6 replacement breech seals for the Ignite Black Ops Tactical Professional Grade Sniper Air Rifle. Here's some more detailed information on performance of the QB79 PCP Repeater. 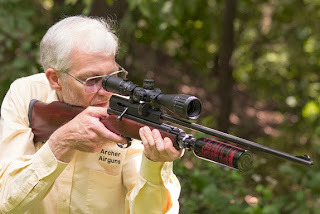 In particular, this post is to show the outstanding consistency of muzzle velocity that's available with this product. Our test results for the .177 cal QB79 PCP Repeater were recorded, fed into a spreadsheet and plotted out as a graph. As you can see, the different tune levels were achieved in three ways. The greatest consistency - with 168 "good" shots, but lower (760 fps) muzzle velocity is achieved using the standard factory hammer spring. 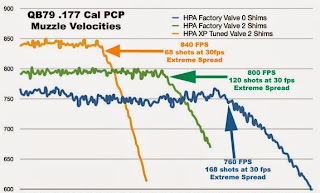 This gives the most efficient performance in terms of total muzzle energy (1,669 ft/lbs - the sum of the muzzle energies for each individual shot) before reaching the 30 fps Extreme Spread shot, but the lower muzzle velocity is not what many people would prefer. More muzzle velocity (800 fps), but less (120) good shots, is obtained by slightly shimming the hammer spring with a couple of washers. This gives less efficiency, with a total of 1,336 ft/lbs of muzzle energy before the 30 fps Extreme Spread shot. 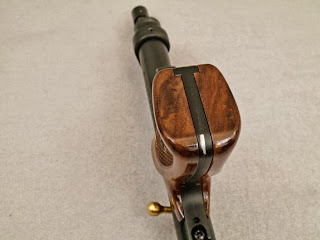 The third level of tune combines the shimmed hammer with the Archer Airguns XP Tuned Valve. This is a real air hog, with much lower efficiency (just 842 ft/lbs total muzzle energy before the 30 fps ES), but it does deliver the highest muzzle velocity of 840 fps with 68 "good" shots - still enough to complete many field target courses without refilling with air. Here's the test targets for the mid level (800 fps and 120 good shots testing). 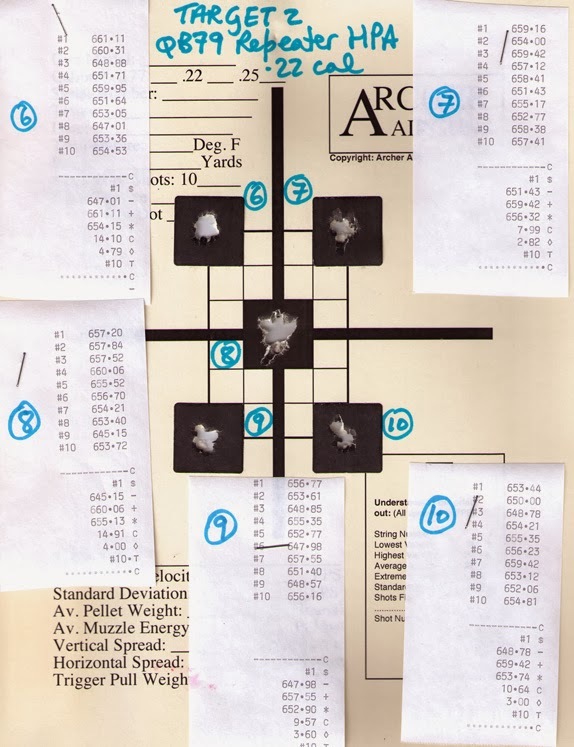 Each target has 5 bulls, shot in the sequence shown and with the Chrony prints stapled next to each target. Here's the same data presented for the QB79 Repeater in .22 caliber. The gun is more efficient in .22 caliber, with total muzzle energy of 1,844 ft/lbs for the 575 fps/180 good shots level. 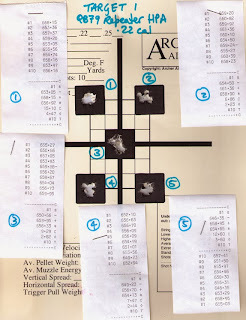 At 125 good shots, it's 1,700 ft/lbs total and 839 total ft/lbs for the maximum muzzle velocity (690 fps) tune level. 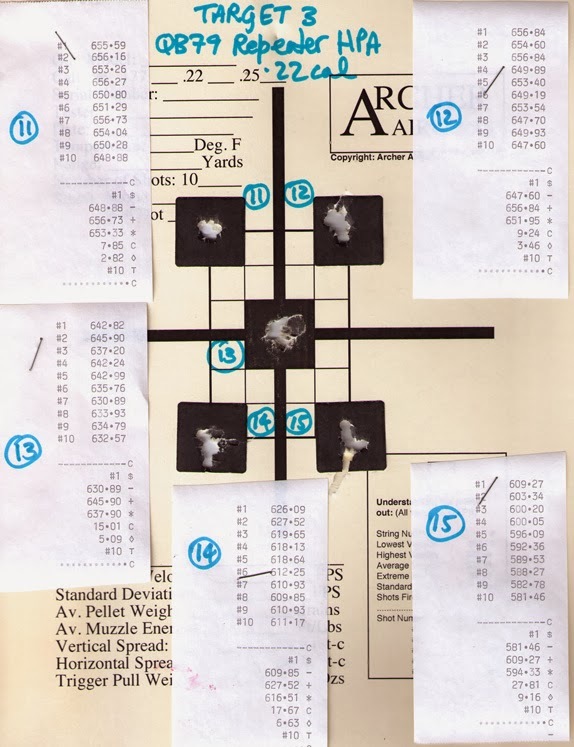 Please note that in all cases, these tests were made with unsorted Crosman Premier Hollow Point pellets, fired "straight from the tin" at 10yards range. I hope this gives some useful and interesting detail to those who have questions about the performance of the QB79 PCP Repeater. 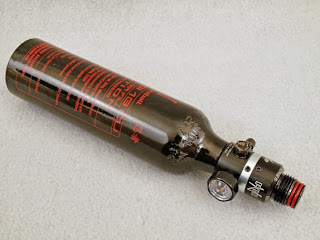 This version of the QB79 Repeater uses a REGULATED Ninja High Pressure Air (HPA) tank, giving 1100 psi air pressure in the gun. The result is increased muzzle velocity and freedom from temperature changes due to rapid fire and changes in ambient temperature compared to the CO2 versions. 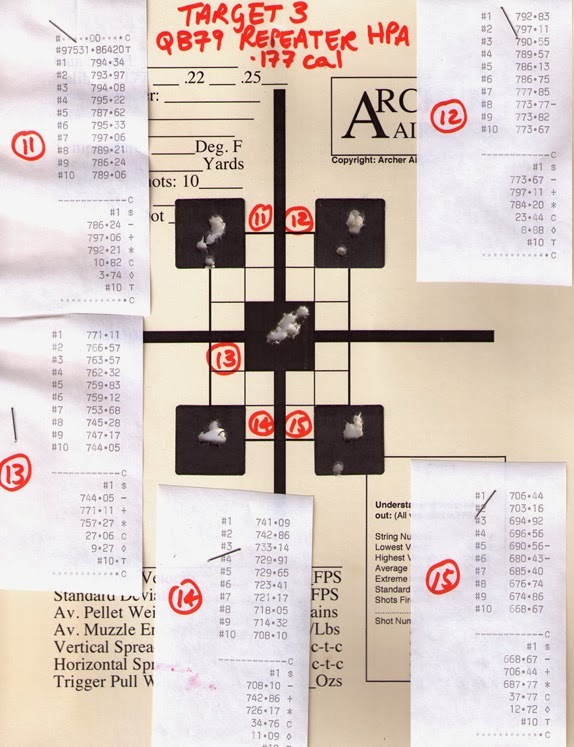 This has always been part of our QB78 and QB79 Repeater development plan as it's the perfect way to overcome the issues associated with rapid fire and shot consistency. You can select from a choice of three tune options that gives your selection of shot count and muzzle velocity. As you can see, the QB79 PCP Repeater offers between 55 and 180 shots (depending on caliber and tune level) with an Extreme Spread of 30 fps - the consistency benchmark used by precision Field Target shooters. By using a regulated tank, the QB79 PCP Repeater gives a huge number of shots with a practically constant muzzle velocity (better than 30 fps Extreme Spread). 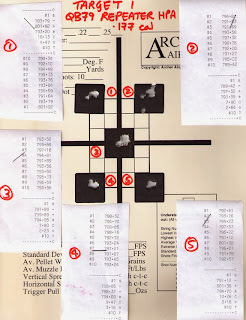 This is a massive practical accuracy benefit when shooting the QB79 PCP Repeater. 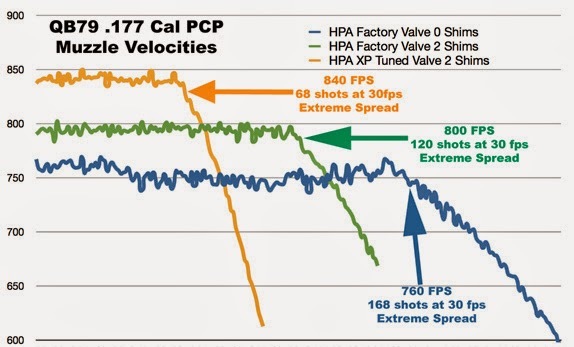 There's no way that any QB78 PCP conversion can offer this combination of shot count and consistency due to limited air capacity and lack of a regulator! 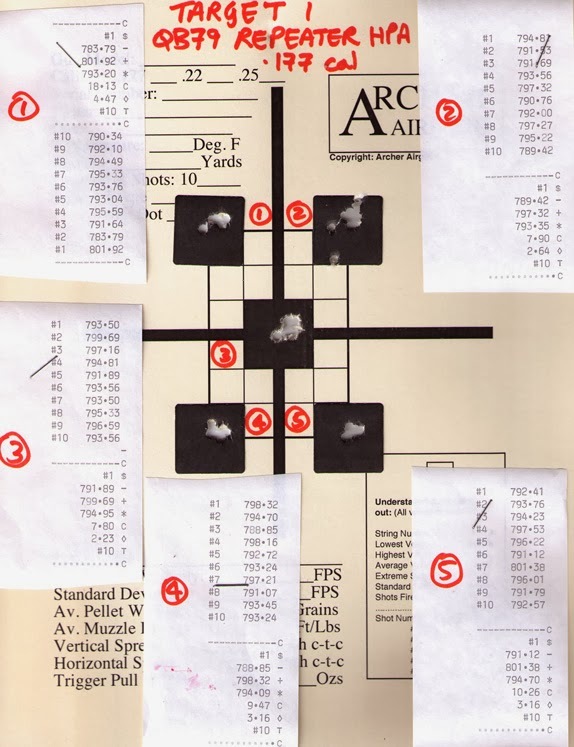 All unregulated PCP air rifles suffer from a shot curve of varying muzzle velocities which limit the (relatively small) number of shots attainable before vertical inaccuracy requires a re-charge, as Discovery and Marauder shooters know very well. If you already have a QB79 or QB79 Repeater air rifle, we also have this regulated Ninja 13/300 HPA tank that will enable you to simply convert your gun from CO2 to PCP operation. All these new products are in stock and shipping from today! PLEASE NOTE THAT NO HPA TANK WITH AN OUTPUT OF MORE THAN 1100 PSI SHOULD BE USED WITH THE QB79 OR QB79 REPEATER FOR SAFETY REASONS! 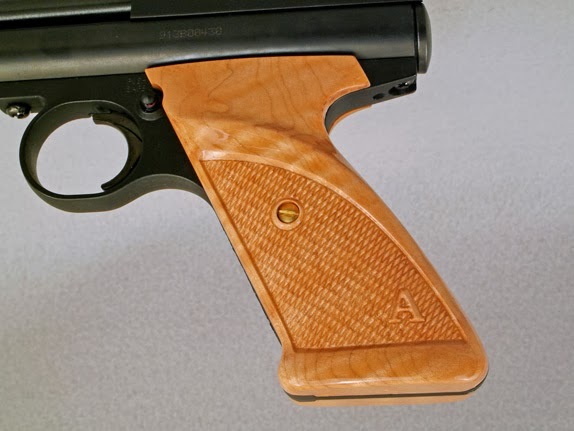 New from Archer Airguns are the first of a new range of beautiful custom wood grips for Crosman 2240 air pistols. These gorgeous grips are created right here in Up-State New York, USA to the highest possible quality standards and are the perfect way to make your 2240 “look and feel like a million Dollars”. The combination of select woods, state-of-the-art CNC manufacturing, careful hand finishing and real artistry in design ensure that these grips are unsurpassed in both quality and value. Above. Highlights of Archer Airguns Ambidextrous Walnut Grips for Crosman 2240 and 1740 Air Pistols. Below. See how the grips fit perfectly to the pistol frame. Double click on any photo for a closer look. 1. 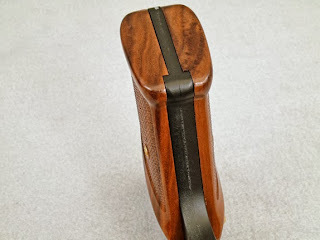 Beautiful, precision checkering on both left and right sides for excellent grip and functional beauty. 2. Precision fit to the Crosman frame - the fit is so good that they almost don’t need the screws to hold in place! 3. Careful design follows the Crosman frame shape exactly, with cutouts around the safety and coverage of the rear frame joint. 4. You can order online and the grips are shipped to you in just a couple of days. No long wait times or need to send checks by “snail mail”. Buy these grips as the same time as our parts and accessory kits - save on shipping! 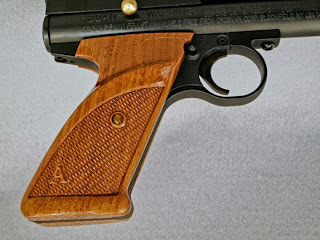 These ambidextrous walnut grips are designed to feel “full” in the hand, with natural support for your trigger finger. The checkering gives excellent grip, without the aggressive sharpness of the Crosman plastic grips or the slipperyness of uncheckered grips. The grips are supplied complete with replacement brass screws. The wood finish is multiple coats of high gloss lacquer. The first introductions are in walnut, curly maple and white oak. Saepele (similar to mahogany) will be offered shortly. 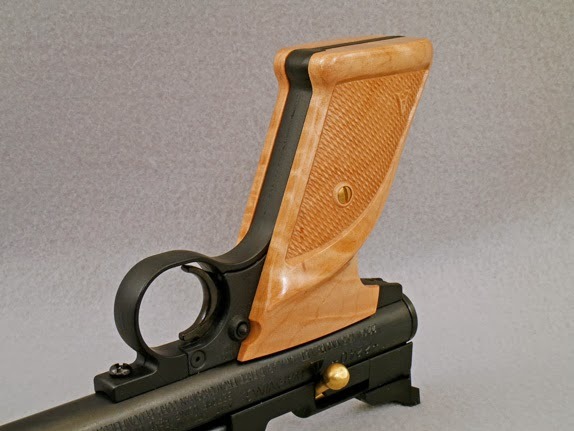 Above and below are the Archer Airguns Curly Maple Ambidextrous Grips for 2240 Air Pistols. And here is a shot of the Archer Airguns White Oak Ambidextrous Grips for Crosman 2240. 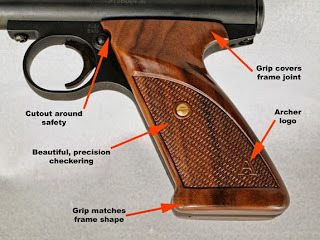 Please note that as wood is a natural material, no two sets of grips will look exactly the same. Our photographs are intended to give a representation of the quality you can expect to receive. These grips fit the Crosman 2240 and similar models (2300S. 2300T etc.). 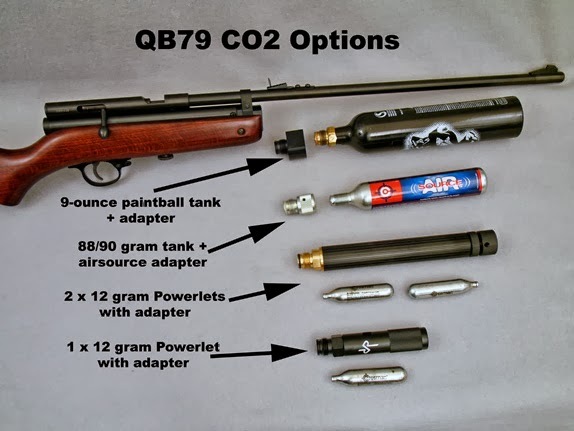 Use 12 g Powerlets With Your QB79 Air Rifle. So many times, we've been asked "Can the QB79 or AR2079 be used with 12 gram CO2 Powerlets?" Up to now, we've had to answer no. But that's all changed with Archer Airguns' introduction of two adapters which allow these popular 12 gram CO2 bottles to be used with the QB79 air rifle. One adapter accepts one Powerlet if you simply want to shoot 20 - 25 shots from your air rifle, the other accepts two Powerlets, offering around 50 good shots- just the same as a QB78. This gives the QB79 unprecedented versatility in the number of ways that you can feed it with CO2, as the photo below shows. 1. 9-ounce paintball tank - in conjunction with the Archer Airguns QB79 Tank Adapter. 2. 88 or 90 gram Airsource tanks - in conjunction with the Crosman Airsource/Paintball Adapter. 3. 2 x 12 gram Powerlets - with the RAP4 Dual 12g CO2 Adapter. 4. 1 x 12 gram Powerlet - with the RAP4 Quick Change 12g CO2 Adapter. Here's how the QB79 looks with the Dual 12g CO2 Adapter installed. Below is a closeup of the Dual Powerlet Adapter. And here we have a close view of the single Powerlet adapter. 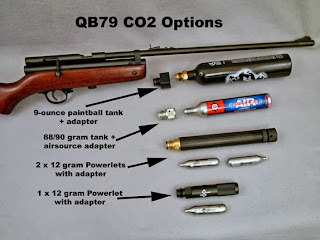 This range makes the QB79 - together with the AR2079A and AR2079B - by far the most versatile CO2 air rifles available when it comes to choosing the CO2 source to power them. And all are interchangeable, so you can use as many of these options as you want! The Ninja PCP Fill Stations are the ideal way to fill your PCP air rifle simply, safely and efficiently. 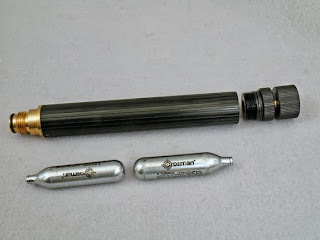 They combines a "state of the art" 4,500 psi carbon fiber HPA tank, together with a regulated output that automatically limits the pressure entering your air rifle to the correct level. Archer Airguns has two versions of the Ninja PCP Fill Station. 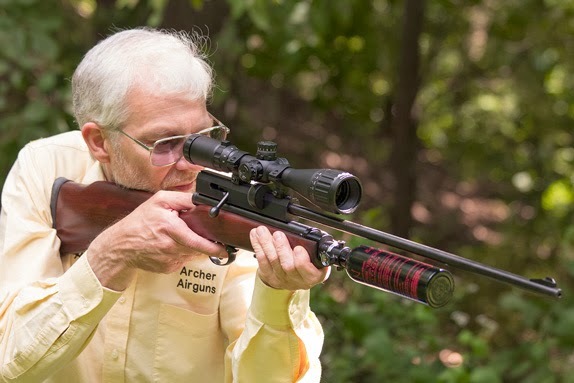 The Ninja 3,000 PSI Fill Station Works with the Benjamin Marauder, QB78 PCP Repeater and other air rifles safely accepting 3,000 fill pressure. The Ninja 2,000 PSI Fill Station is specifically set up for the Benjamin Discovery and Crosman Challenger which require 2,000 psi fills. 2. 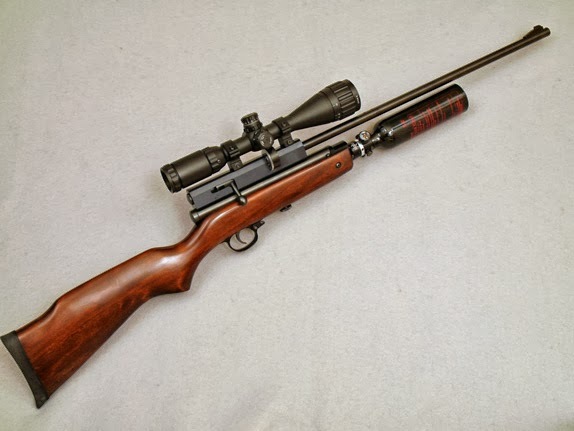 Because the tank has a regulated output, there's no danger of accidentally overfilling your airgun SO LONG AS YOU CHOOSE THE CORRECT VERSION TO MATCH YOUR AIR RIFLE. With the Crosman Charging System, you have to judge the fill pressure manually, making it possible to inadvertently overcharge the gun. 3. The pressure gauge measures tank pressure, so you know how much air you have remaining in the tank. The Crosman Charging System has a gauge that measures output pressure only, making it easy for the tank to run out of air without you knowing. 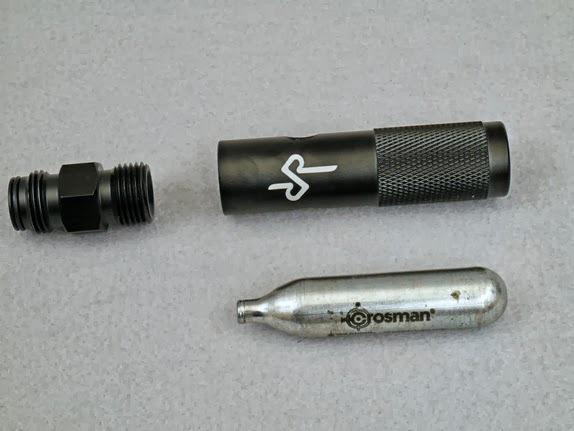 No additional adapter is required to fill the tank or connect this Fill Station to your air rifle if it is fitted with a male paintball standard quick disconnect fitting. The fill connection is also a male paintball standard quick disconnect fitting. 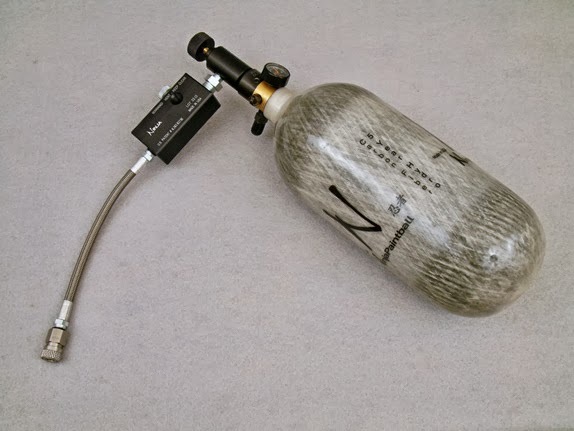 So, the tank can easily be filled by any local paintball store that can supply 4,500 psi air. These Ninja PCP Fill Stations have a 90 cubic inch capacity and are supplied complete with a female Foster quick disconnect fitting that fits directly onto your Discovery, Marauder or QB78 PCP Repeater. They are D.O.T. and T.C. approved and have a 15 year lifespan with 5 year hydro tests required. You should obtain around 20 - 25 refills of a Discovery or Challenger 2009 air rifle and around 7 refills of a Marauder or QB78 PCP Repeater, although your results may vary, of course. Of course, the Ninja PCP Fill Stations include a bleed valve and they're made in the USA.